Join Easter Seals-Goodwill in our mission to provide exceptional services that offer hope, help and independence to people with disabilities, to the disadvantaged and to their families. Now you can create a personalized Web page and raise funds online on behalf of Easter Seals-Goodwill … and it’s easy! Honor a friend or family member, or tell your own story. 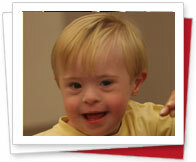 Use text and pictures to tell others why you support Easter Seals-Goodwill, and why they should, too! You can also support other Champions -- people just like you -- who have created Web pages to raise funds for Easter Seals-Goodwill.